Since Group 3's total cholesterol rose so high, they were excluded from further analysis. "A decrease in HDL and an increase in LDL cholesterol occurred after cholesterol feeding." 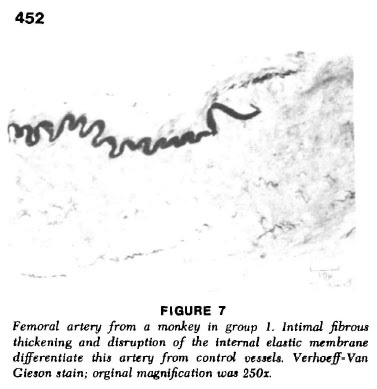 "Clearly elevated lesions [on the aorta] were positively identified only in the [cholesterol-fed] monkeys." "The [cholesterol-fed] monkeys had more intimal thickening expressed as cross-sectional area than did the control group. ... The involved areas contained significant fibrous and lipid elements. Foam cells were seen to a variable and sometimes prominent degree." "The monkeys fed the higher amount of dietary cholesterol showed an increase in hepatic [liver] cholesterol." 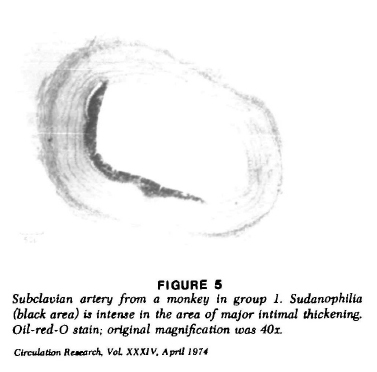 "The regimen for group 1 was originally designed to demonstrate a null point of the effect of dietary cholesterol on the arterial intima. However, such a point was not found; no threshold for dietary cholesterol was established with respect to a putatively adverse effect on arteries." They thought that Group 1 monkeys, who received the smallest amount of dietary cholesterol (equivalent to about 86mg cholesterol/day for humans), would not experience adverse effects. They did. "The effects of dietary cholesterol on serum cholesterol are, in part, dependent on the diet and the characteristics of the individual consuming the cholesterol. Dietary cholesterol has a much greater effect on people consuming a low-cholesterol diet, with a threshold effect as shown by Connor et al. In their 1961 study, Connor et al also showed that egg yolk, containing 240 mg of cholesterol, had a greater hyperlipidemic effect than pure crystalline cholesterol dissolved in oil. 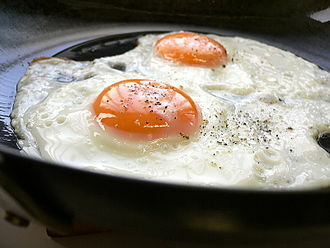 In people consuming a low-cholesterol diet, egg yolk intake increased fasting serum cholesterol level by 40 mg/dL." ________Thanks for this post go to a commenter on Don's Primal Wisdom blog, who went by the name of healthy-longevity. Yummy-looking eggs--nice deeply colored yolks! The more important issue is the postprandial effects of consuming cholesterol, including egg yolk. Focusing on fasting serum cholesterol levels misses the bulk of the problem. Even though serum cholesterol rises very little after a meal, dietary cholesterol increases the susceptibility of LDL-C to oxidation, vascular inflammation, oxidative stress, and postprandial hyperlipemia and potentiates the harmful effects of saturated fat, impairs endothelial function, and increases cardiovascular events. Stamler J also pointed out in regards to animal studies and several prospective studies on humans that the association between dietary cholesterol and atheroslcerosis and coronary heart disease is in part independent of it's effect on serum cholesterol levels. You know, this is a really good point. The reason the monkeys who developed high serum cholesterol in this study were excluded is because "they clearly failed to meet the criterion set for the experimental monkeys" which was to have "plasma cholesterol maintained within the limits found in monkeys fed cholesterol-free diets." 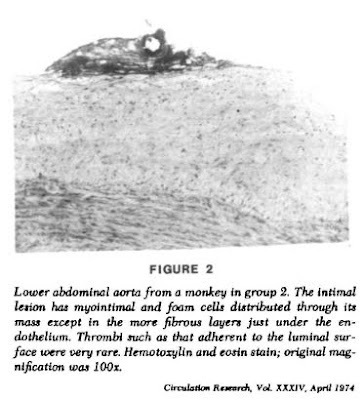 So, here we have monkeys whose cholesterol was within the range of monkeys who weren't eating any cholesterol, but they still developed plaque, lesions, and arterial elasticity problems linked to the cholesterol they were eating. From a brief perusal, it seems that the control group did fine. The interesting thing is that their diet was 39% fat and 41% carbs. Certainly not low in fat. I also get the impression the authors thought this diet unremarkable. Was 1974 before the widespread acceptance of the low-fat dogma?